Stayclean Ltd use both the traditional ladder method and newly accredited Reach and Wash Pure Water Fed Pole System. All in accordance to the current Health & Safety Regulations. The reach and wash system we use consists of several sections of carbon fibre/aluminium pole, of different sizes, telescoped one inside the other. Each section has a pennel clamp device enabling each section to be adjusted independently in length. A special hose runs up inside of the pole pumped from a water holding tank within our vehicle. The system uses 100% pure de-ionised water to leave windows smear and spot free! Without using chemicals or damaging the environment. 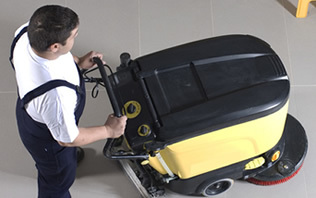 The reach and wash system eliminates many worries with health and safety and allows access to areas otherwise inaccessible or too expensive to clean using other access techniques such as hydraulic platform. Our traditional methods by use of ladder are all carried out in accordance with health and safety regulations. 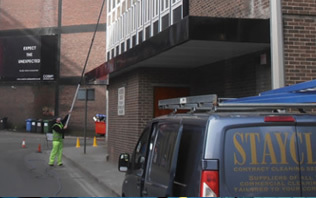 Incorporating both methods of reach and wash and ladders and also when necessary abseiling – scaffold towers and both lorry mounted and self propelled hydraulic platforms enable us to provide a complete window cleaning service. 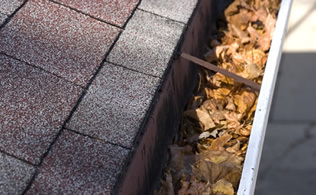 Risk assessments and method statements are carried out. Our workforce are fully trained in safe working procedures. All personnel receive ongoing intensive training. Personal protective clothing and equipment is used. Stayclean approved equipment is used at all times. All accidents are reported and recommendations actioned. All relevant environmental laws and regulations are complied with.